We love the concept that Rebecca Luminarias came up with for using leftover random tidbits–it's something most creative types enjoy doing when bumping into cute, keepable combinations created on the fly. Great ideas come and go-stockpiling them in one place for future use is genius. REBECCA LUMINARIAS: When I'm making projects, I will inevitably collect random bits and pieces that I love but that don't make it onto the current project. So I pin them onto a clipboard, which I hang on the wall, and as the collection grows, I'll eventually re-visit it and try to make a new project out of the cluster of embellishments that has accumulated. My most recent clipboard was born from Journey and the idea of 'letting go' of fear and anxiety and just being free. It's not necessarily about taking a vacation, but more of a pep talk for myself on the way I'd like to start living my life. So I went from the organized pile of encouragement to these cards and tags...It was an awesome way to work, too, because while I've been collecting items on the clipboard for awhile, I had 2 cards and 2 tags made from them in under an hour, and for me, that's unheard of! But just about everything I needed was right there! When we received word of the clipboard assignment, I knew right away that this would be my project and so I would look up at my board on the wall from time to time and mentally put different things together. This card almost made itself. 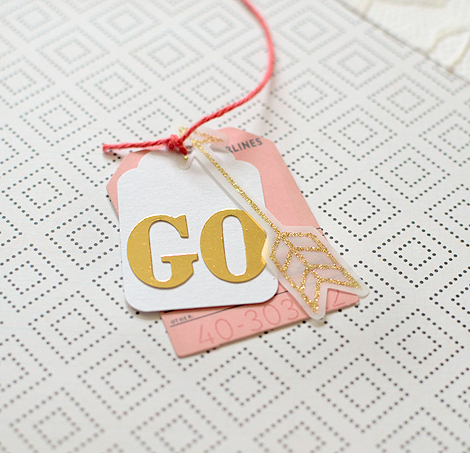 I made the 'go' tag during my last Journey project but didn't end up using it. At the time, I coupled it with the 'have more adventures' acetate tag and loved them together, but wasn't making anything with the set that I loved so they got pinned to the board. I returned to them a few weeks later for this project, and they turned into a card in about 5 minutes! Don't lose faith! That said, most of the other pieces didn't turn out at all like what I had envisioned. These tags, for instance, were not going to be tags and I had planned to use the 'let's go' phrase on a card with the 'explore' wood piece. In the end, I separated them into tags and I like them better this way. Incidentally, I've had this cluster of notched tags (as seen below on the 'let's go' tag) clipped together with that same Craft Market mini clothespin since April! Those items were clearly meant for each other. I had the idea that I was going to use the red and white plus-sign paper and the die cut feather garland with the wood frame, but you see how that worked out. This card turned out nothing like the way I originally intended, but that's the fun part of creating, I think--letting your ideas run wild on you because you might be (happily) surprised where they lead. A rough coat of white acrylic paint brightens the cork letters here. Aside from a few outside decorations like glitter tape and doilies, I challenged myself to stick to using only items that were on the clipboard. That also helped make the work go quickly since I've been known to spend an embarrassing amount of time gathering embellishments. I didn't get to using everything on the clipboard so I began a new one...and I like it already. I love that it hangs on my wall, growing and changing, inspiring me for future ideas and projects. Going BIG on layouts is turning into a major trend these days. From photos to alphas, the motto "bigger is better" reigns king. Here with a mega-sized photo layout is CP team member, Maria Lacuesta! MARIA LACUESTA: I went big with today's layout! This is one of my favorite photos from Memorial Day weekend and I wanted it to feature prominently in the composition. Because my image goes from edge to edge, with only a bit of white space on the top and bottom, I decided to add embellishments directly on the photo itself. 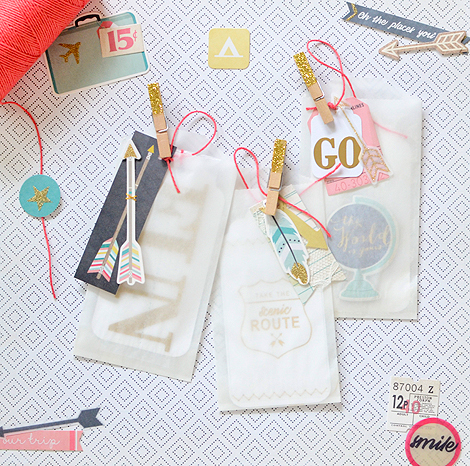 The wood veneer die cuts in the Journey collection are some of my absolute favorites. I love them for the super cute designs and how thick the wood is. They feel so special and I have to admit, I was kind of hoarding them! But the time finally felt right and I used the "Explore" die cut as a large title for my page. I glued the wood veneer on top of a jumble of hot pink thread because I liked the pop of color against all the woodsy neutrals in the rest of the layout. To add a bit more texture, I ran all four sides of my photo through my sewing machine. My stitches are messy and irregular, but I love that look...which is fortunate because my sewing skills are pretty non-existent! The rest of my embellishments are from the Journey collection as well, including the perfectly coordinating puffy stickers and die-cut vellum, which I scattered around my title. There's a tiny bit of journaling right below my photo that is handwritten on a die cut ticket from the Journey ephemera pack. Then as a finishing touch, I added more puffy stickers to the white space on the bottom of my page, creating a little border. I tend to mix and match supplies a lot, but creating this page, using exclusively the Journey embellishments, reminded me how fast and easy it is to use just one collection at a time! MARIE LACUESTA: I managed to squeeze in another mini book this month and, again, it was so easy using one of Crate Paper's handy cut-apart tag papers. I was saving the 'Let's Go' paper from the Journey collection expressly for this purpose. 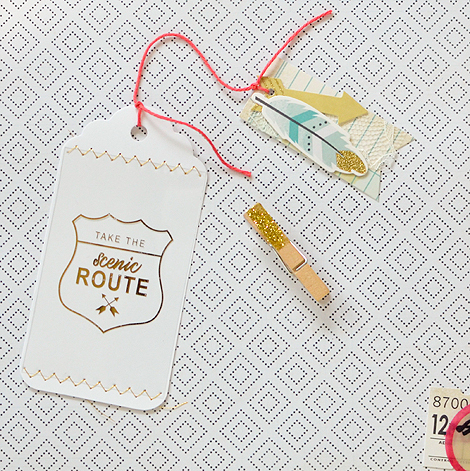 Throughout the album, I included some really fun ephemera from the Journey collection, along with cute embellishments from Confetti by Maggie Holmes. On the cover, I also sewed on a bit of lace for added texture. 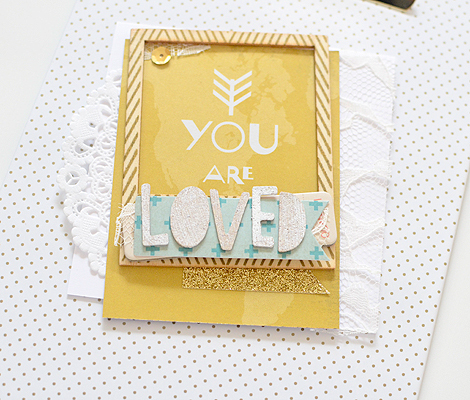 I love the wonderfully thick chipboard stickers from the Journey collection and really wanted to showcase a few of them, so I used plain white cardstock by American Crafts as a simple backdrop. It was so easy to achieve a layered affect in my album using the 'Let's Go' paper because it included tags and cards in different dimensions. Glitter is another great way to add texture and here I used some ribbon to create a small banner. I love the Mason Jars from the Poolside collection and I couldn't resist including one in the album. I can't wait to include ephemera from my adventures in this little pocket. 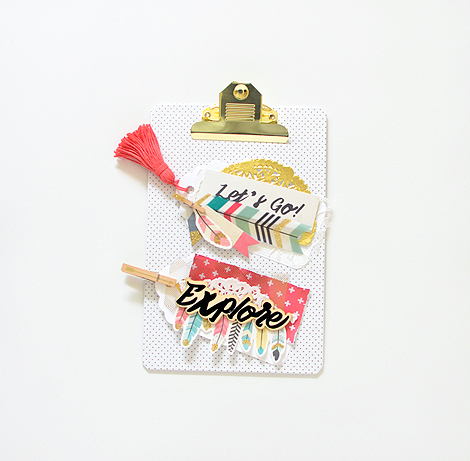 Because all the cut-apart tags from the 'Let's Go' paper are double sided, I simply finished off my back cover with a little bow from the Confetti collection. It couldn't have been any easier! Mini Albums have always held a special place in our heart. They're tiny, portable and make a great companion when out and about traveling to different destinations. CP Gal, Maria Lacuesta, crafted a mini about a recent trip to Portland. She loved it so much, she made duplicates for her travel companions. I love making mini albums and I'm so excited to share my newest one documenting a recent getaway to Portland, ME. For my cover, I tinted a photo of Maine's beautiful rocky shore, printed it 8" x 6" on matte photo paper, and folded it in half. I also used Thickers from the 'Journey collection' to create a bold title on the front of the booklet. I thought it would be nice to make duplicate mini albums for each of my travel companions as well, so I kept things simple. My plan is to slip the albums into small envelopes and drop them in the post, so I wanted to keep all my pages relatively flat. This was easy to do using a basic pamphlet construction for the base of my album. I simply secured the pages with staples in the center fold using a long arm stapler. This is the fastest method I've used to create mini albums. For the inside of my album, I limited my materials to patterned papers from the 'Confetti' collection by Maggie Holmes, puffy stickers from the 'Journey' collection, vellum, and typed journaling on plain white paper. Because the rest of my mini book was so simple, I wanted to create a layered effect, so I cut pages of varying sizes. 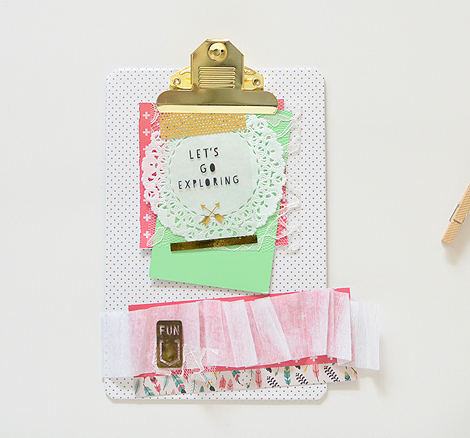 It was such an easy way to add interest to my album and incorporate a bit more patterned paper. In the center of my album is a big two page photo. I love the impact of this oversized image and I decided to keep these pages free of any embellishments or journaling. In these pages, you can see all of the different layers I incorporated into my album. I had to be mindful of the sheer vellum and various elements in order to keep my composition cohesive. And no project is complete without a few happy little accidents. On the left, my vertical photo is too big and hangs off of the small horizontal page it's attached to, but I think the layered effect here works. On the right, you can see the backside of a photo through the sheer vellum, but I think the white space adds balance to the page. And on the last page, the photo I printed is clearly too big to fit onto one page, so I had to cut it into two pieces. But again, I really like this "imperfection" and wouldn't want to change it. Now to start making duplicates. I'm confident it will be easy with the simple design I used and I cannot wait to begin mailing all my little albums! This simple, not-so-layered post from CP Gal, Rebecca Luminarias, brings together two wonderfully playful worlds–Tags & Crate Paper's "Journey" collection. There are some soft pretty glassine bags to peek at too! Simple doesn't have to mean boring. I've always loved the layered look but there are times when I find myself moving in a more minimal direction--simplifying things a little bit. So many embellishments can stand out on their own if given the chance. At the very least they need only one or two other pieces to compliment them. That's the focus of my project today--simple tea tags. I like this idea of creating a larger tag and anchoring it to a smaller one, in essence, making a tea tag. I've carried the sparse feel over to this set by choosing some statement pieces from the Journey collection. I started with a basic, store-bought white tag, added a layer for texture and finished it off with the focal point--in this case the glittered F-U-N alphas. 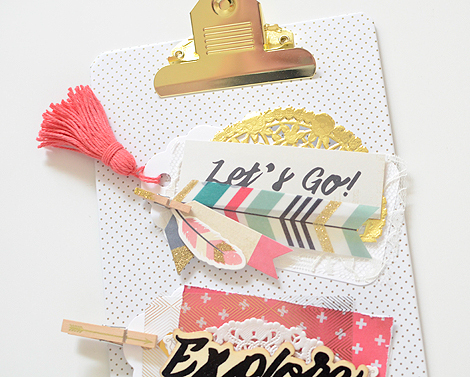 The second part of the tag is cut from the 'Let's Go' accent cards patterned paper. I stitched a die cut arrow to it and then tied the tags together. So simple and easy but not boring (at least I don't think so!). Lace is one of my most favorite textures to use in paper crafting. In a photo, you almost feel like you can touch it which adds to the sensory element of the project. 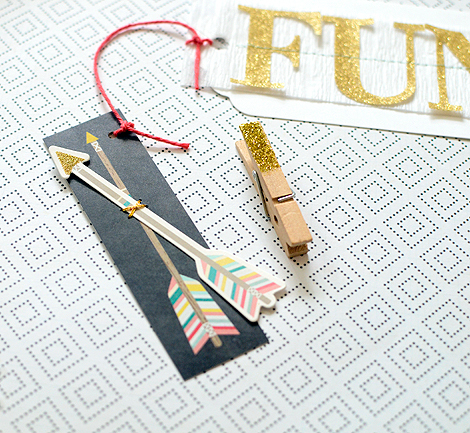 The glitter vellum arrow on the smaller tag invokes the same feeling. I've made no secret of my excitement in the growing number of textures in recent Crate collections, and that's one reason why. Different finishes lend an extra element of interest. When I'm creating I often find myself saying the word unnecessary in my head. Take this tag for example. 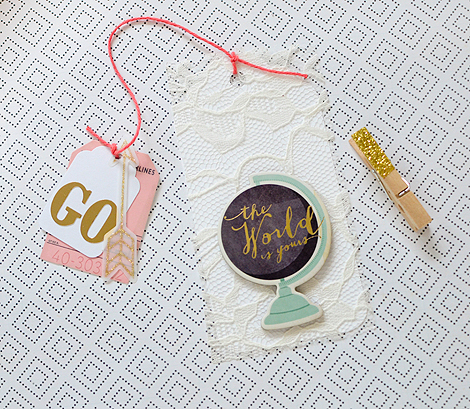 The larger tag simply has a gold foil printed acetate card that has been stitched to it. I really liked the way that looked, uncluttered and minimal. A part of me felt obligated to add more to the tag, for some reason, but I didn't want to stick something on there just for the sake of using more embellishments. So I dared to leave it be, allowing it to make a statement all on it's own--'take the scenic route'. And I'm glad I did. Let me say that just because this is a minimal project, that doesn't mean that it's any easier than it's layered, clustered, piled on counterparts. It still takes me a lot of playing around--positioning, repositioning, adding, subtracting--to achieve the right balance. I'm not much of a sit-down-get-it-done-in-thirty-minutes kind of crafter. I fuss quite a bit, even on projects that have very few embellishments. But that's all part of the fun, right? Spring into Color with Crate Paper! Monday's Spring in Color includes a full step-by-step tutorial for creating a true-to-style Marcy Penner layout; simple, modern and mildly layered. One of the reasons I love using white as a background is that colour pops right off it! While the grass is still not entirely green just yet, it hasn't stopped me from dreaming about Spring colors. I paired it with a photo of my youngest climbing a rock wall last summer. The little color splotches mimicked the foot-holds so well...it's a great match! With a photo that has so much sky in it, I wanted to make sure that I pulled out the airy happy colours from the inspiration. I started by going through the papers from the newest releases and pulling out the colours in the inspiration piece. I chose one colour to mat the bottom half of the white cardstock with. Then, I layered additional papers on the right side and arranged my photo on top. I glued them down once I was happy with them. I thought the "Take the Scenic Route" from the Journey wood package would work wonderfully next to my plain manila tag. My initial thought was the wood piece would nicely overlap the photo where there was a lot of negative space. I then tried placing the sign in the center of the white portion of my page and immediately fell in love with the arrangement instead. 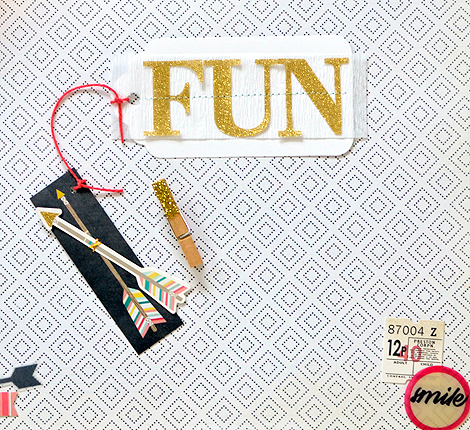 I pulled out some arrows and other die-cuts that benefited the idea behind my page and I clustered them around the tag. Some journaling, stitching, a few more embellishments and I was happy. Sometimes, it's fun to sit down and create projects on a smaller scale. It allows for greater exploration and doesn't require a big commitment when there just isn't the time to give, especially during the busy summer months. Here to talk more about it with the help of Crate's Journey collection is CP Gal, Marcy Penner. Lately, I've been feeling the pull towards smaller projects. More doable and multi-faceted. This prompted me to move into a 6 x 8 album for my Project Life pages. Maybe this is a temporary shift. Who knows. But, I love that it's totally okay to try new things when you feel like you're in a rut! Thank goodness! For this spread I started by laying out my photos. I kept this entire spread focused on a quick weekend trip we took a few weeks ago. I was too busy having fun that I really didn't take a lot of pictures. I was grateful for the smaller size letting me keep one story on a spread, even though I didn't have a lot to include. I added a piece of packaging and our hotel room number as well to fill in some space. I had just received a box filled with supplies from the new Journey collection and thought those would be perfect here! I thought one of the little tags from the Journey paper would make a great little title card, so I cut one out and added some string to make it look like a real tag. I also pulled out a chipboard "traveler" sticker that I thought would work. I typed a portion of my journaling on the top half of a white card and handwrote a little on the bottom. I added some journaling to the empty space that resulted from the packaging being a little narrow and did a little rearranging. Usually I try to spread out my journaling on my spread. Going back to the tag, I added some journaling and stamped the date of our trip. And my spread's pretty much complete. I realized that my two photos were quite contradictory. The photo on the left features our clothing in a suitcase...all neutrals (white and black mostly). The photo on the right features an array of colors. I thought I'd maybe include some journaling about my love for both opposites while I was at it (even though that topic has nothing to do with this trip). I took a white tag and punched three holes down the end. On one side, I journaled about my love for neutrals. On the other, I journaled about my love of the rainbow. When it's flipped over, it will coordinate with the picture beside it. I enjoyed using this size during the summer months last year and hope I'll find it just as fun this year. If you are a photo gadget lover, today's post will strike a cord as Jen Chapin pairs 'instantly printed photos' with Crate Paper's new travel collection, Journey. We had no idea the gadget even existed! Super cool–we just might have to run out and buy one. 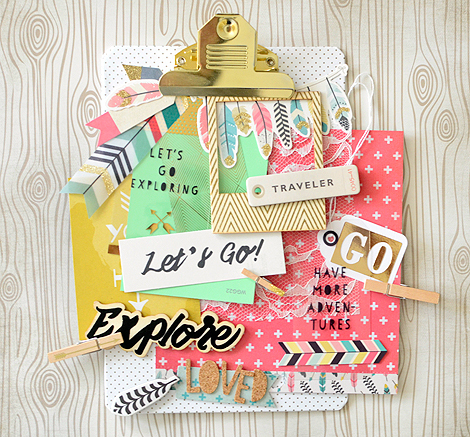 It's a fab tool, alongside Journey, for on-the-go scrapbooking! Hello hello! 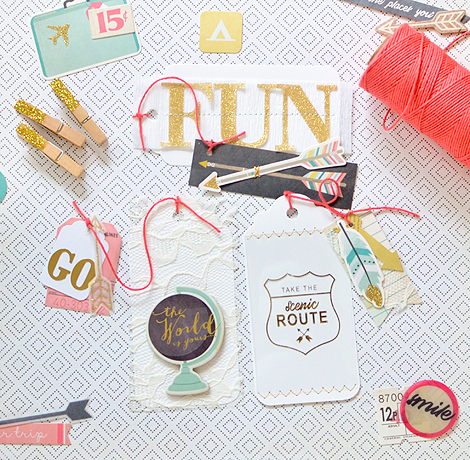 Jennifer Chapin here, and today I'm sharing a travel themed layout using the new Journey collection. 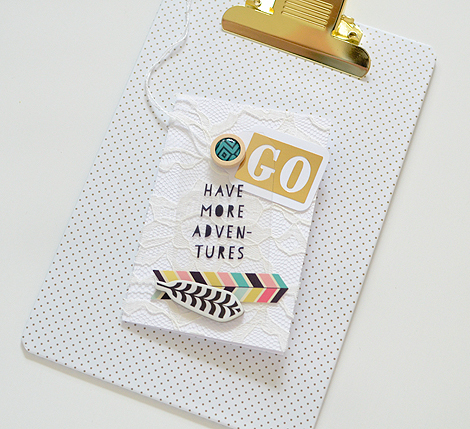 It's just perfect for documenting vacations, road trips, and anything in between! A few years ago, we went to Las Vegas for my 30th birthday. It was such a fun getaway, and we got to go with friends and had a blast. Believe it or not, I have not documented too many photos from this trip! I started a mini album with good intentions, but it is still sitting on my shelf about half done. I thought I would dig out a few photos to pair with this collection and make a 12 x 12 layout. Recently, I purchased a Fujifilm Instax printer. I have one of the cameras which is fun too, but this appealed to me as I could print photos that were previously taken on my phone. This printer is even small enough that you could take it on a trip with you and scrap on the go. How fun would that be? I found a few photos from my trip and transferred them over to my iPhone. There are a lot of vacations when I don't even take my big camera with me. Depending on where we are going, many times it is much easier to just take my phone and not quite as intrusive. Don't get me wrong, I love the photos I get from my DSLR. But especially now with all the new editing apps, the iPhone is great too. And you know the saying.....the best camera is the one you have with you. So don't let that deter you from taking pictures on your next trip! After I printed my photos, I started on the page. I knew that I wanted to use the big chalkboard letter stickers from the Journey collection. I used a ruler and a pencil to draw an even line across the page, then placed my letters on that as a guide. I later erased the pencil line. I also mixed some fonts by adding some of the beige Thickers from this collection. After my title was complete, I added my photos and started filling the page with bits and pieces. I used chipboard, ephemera die cuts, vellum and wood veneer from the collection, working from the title and around the page. Here is the completed layout! I love how it turned out. I even got to use one of the adorable gold chipboard states from the collection and added an enamel star where Las Vegas its. As you can see with all the different textures this makes for a really striking page. The white background is also nice as it doesn't compete with any of the colors or elements that I used. 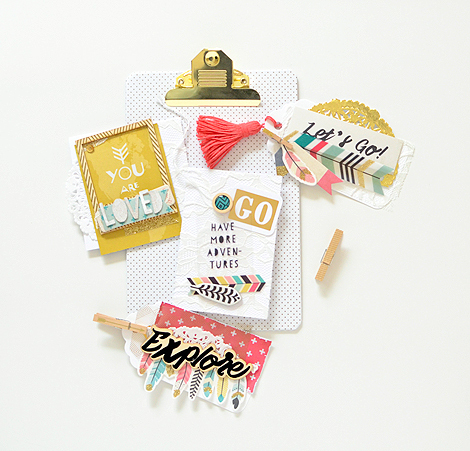 I hope by now you have gotten your hands on some of this great collection and scrapbooked some of your own vacation photos. If you have projects please link them up in the comments, we would love to see them. Thank you for coming by the Crate blog and have a great day! This week we're going to spend time peeking at the incredible project samples that were presented at the Crate Paper booth over the weekend in honor of the Craft and Hobby Association trade show. Not surprisingly, this season's batch of handmade creations were a total success thanks to the terrific CP Gals who worked night and day to bring them to life. They truly outdid themselves again and the booth looked AMAZING! A special thank-you to Christine Middlecamp, Melissa Phillips, Rebecca Luminarias, Jennifer Chapin and Maria Lacuesta. Christine: You won't need to take an expedition to enjoy all the little luxeries that "Journey" has to offer. From petite teepee's, to magical gold overlays, to colorful chevrons and more, this collection is a showstopper! There are a vast selection of papers and embellishments to choose from here and every square inch is worth your scissor's attention. Hands down, this collection is my new FAVORITE. Kiss Kiss might not be new, but it still made a debut at CHA. I took a slightly softer approach with this collection. First, I coordinated a 4-block grid composition and decorated each section with a balance of matching embellishments. The running theme is 'hearts'-echoed throughout. Finally, a pretty arrangement of wooden houses with plush rosettes and tails. I spray painted the houses a champagne gold, covered the backs with canvas and layered cupcake cake liners, one on top the next, to create housing for vintage-inspired flowers and felt. Total cuteness! I have a couple more projects up my sleeve using Craft Market, but I'm going to save them for next week, when we introduce the new 2015 Crate Paper Design Team!! To see our Crate Paper booth front and center, visit our Instagram page starting tomorrow >> http://instagram.com/cratepaper/ Crate Paper Founder, Lisa Parkin, is posting pics direct from the showroom floor!